Two days ago, I went to see a very interesting exhibit (photos by American photographer Garry Winogrand) at the musée du Jeu de paume in the Tuileries. 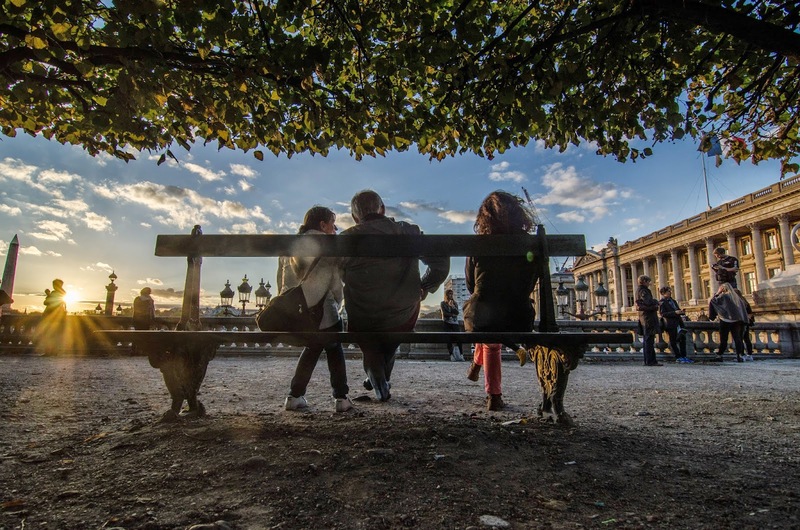 When I came out of the museum, the sun was going down on the Place de la Concorde and there were a few people on a bench admiring the scenery. It was gorgeous. Such a great way to frame the shot, Eric. Ah, Paris. This photo puts me right there. ..and your photo is more exquisite than a realist's painting. It pains me that the Winogrand exhibit was not open when I was there last month, but glad that V will get to see it in November. This couldn't be better if you'd staged the whole scene yourself! Sorry we missed that exhibit—bet it was great. You really captured the moment... as already said: tres jolie ambiance. THANK YOU! Paris rooftops to enter the World Heritage List?